If you haven’t noticed my crazy obsession with cookies, you should check out the recipes tab. I just looked it over and couldn’t believe how much mileage I’ve gotten out of a single food item. And we’re not even talking gourmet concoctions, people. These are all recipes that can be made with very basic materials (and prodigious elbow grease). Preheat oven to 350˚F. Cream butter, the sugars and Nutella until fluffy. Add the eggs, one at a time, beating for 30 seconds between each. Add the vanilla and gently mix. Sift together the flour, cocoa, salt, and baking soda (do not skip this step as sifting eliminates clumps of cocoa). Mix into the butter mixture until fully incorporated. 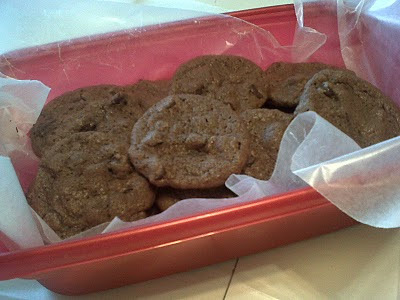 Fold in the chocolate chips and refrigerate the dough for ten minutes. Spoon tablespoon-sized drops of dough onto parchment paper lined (or non-stick) cookie sheets. Bake 10-12 minutes. Allow to cool on the sheets for a minute or two before transferring to a wax paper or aluminum foil-covered table. Yields: 3-4 dozen cookies. Chocolate + Nutella = amazing in all shapes and sizes. And these cookies are no exception. I heard a report that J walked around the house telling everyone how nice L and I were, all the while munching on cookies and smiling. THAT is what I call a good recommendation. well, DUH!! your baking skills are AH-mazing :D and those cookies look like they're ridiculously awesome... probably because of how awesome you are in general. Oh my goodness, those cookies look amazing! Seriously salivating over here! This sounds FANTASTIC. Problem is, Nutella won't last long enough in my house for me to have enough for the recipe. I seriously need to try Nutella! I've been hearing great things about it! this one i must try! love nutella!